The wall. The gate. The closed door. What are they talking about over there? When we consider open learning experiences, we are told (as participants) and we tell others (as facilitators) to “use the space you are in” and branch out from there. But I wonder if, even with a blog hub like Dave’s posts for each learning cycle and all the efforts to pull the disparate parts together to re-align the thinking, we aren’t being exclusive at the same time of being inclusive. Can we be both? I don’t know. I think so. I am intrigued by the notion of being an active insider in at least two spaces (Twitter and GPlus) but a complete outsider in a third space (Facebook). Reading the comments of some folks who have bveen writing in a collaborative document about how positive Facebook has been to their Rhizomatic Learning experiences, I realize only now, later, how rich those conversations must have been. And what people did I miss entirely? Are there whole swarms of folks who engaged in Facebook but nowhere else whose ideas could have informed my understanding? I suspect, the answer is yes. I find myself reading echoes of the past, trying to connect the dots from these reflections to my own experiences, and noticing the gaps, too late. Or not. My own experiences were rich with content and connections, too. While the Rhizomatic Learning Facebook group was open, it was only open if you were in Facebook, and unless I became a member (and thus, had to join Facebook … not happening … see above), I could not view the conversations unfolding there in FB from the outside. 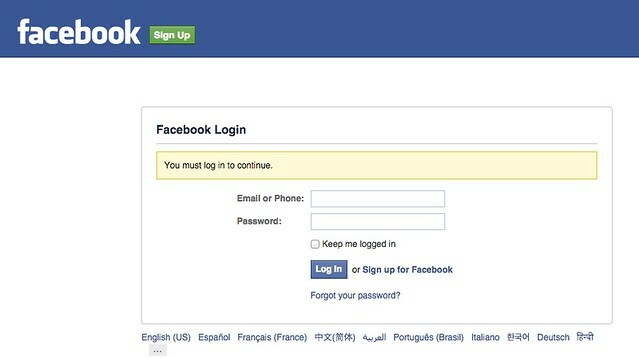 The “Log into Facebook” screen that greeted me when I followed a link was like a locked door, and I did not have the key, and was unwilling to pay the price to be let in. I find it an interesting and intriguing dilemma of open learning: the social media place where the most people are in is the very social media place that keeps the most people out. This entry was posted in RhizoLearning, Technology Resources. Bookmark the permalink. Well, not swarms of people, but I think there were a few. Facebook was way more central to me in rhizo14 than in rhizo15. I’m still pondering why that is. strange isn’t it to think people have had extremely different experiences of the ‘same’ course, but I kind of like that as a representation of a reality that is always the case….. I mean we never have the same experience of anything, we only imagine we do… this is the first time I’ve ever used only facebook to participate in an online course, and am only reading your post because the link’s been posted in facebook by Sarah…. I don’t love the platform but I’ve just been too busy to even think about also checking out other ones – a case of grabbing a minute here and there in between other activities….and Facebook happened to be switched on for data when I was mostly away from a wifi connection… I hope to go back and read contributions properly some time soon! Simplicity for life is a key consideration for why we use what we use, for sure. Well, I think we are in an interesting time where there is not yet a clear path forward, so it makes sense that folks go where they feel most comfortable. For many, it’s FB. For about the same reasons as your hostility to facebook I do not prefer highly to use Google, that makes I do not often visit google+ . But sometimes I do pay a visit to it. 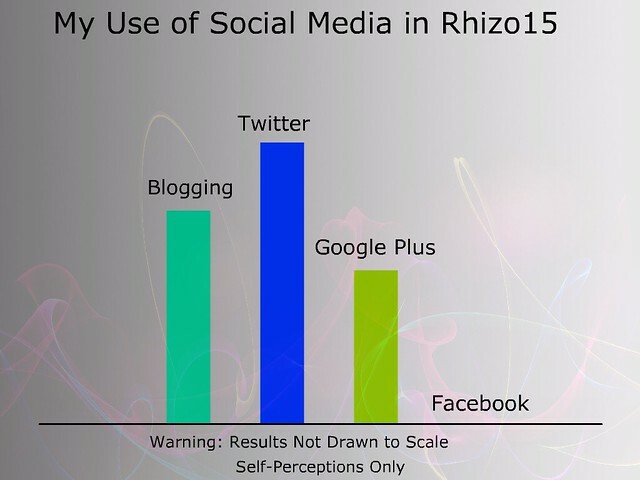 And in my view blogposts and twitten were far more important in #rhizo15 than facebook and google+. (being not a friend of fb yet I do have a little backdoor to watch) Open and proprietary do not go together very well. On internet this discussion is flowering for years, and it is important. By the way some people did publish thier thoughts on twitter and on facebook. Thanks. I suspect cross-posting is the way to go but seems a step too far for some. Refreshing to read your “not enamoured” take on the FaceBook component of Rhizo. In George, Stephen, & Dave’s PLENK2010, my first and life-changing MOOC, they had a central forum in Moodle that provided a home for rich discussions. After PLENK came Change11 with a new philosophy. Discussions to take place in our individual blogs, not a walled forum. But not near as many people visited or commented so the discussions were much more limited. There was the gRSShopper, but it tended to fragment conversations rather than connect them. When we started using FB groups (not quite sure when it started- I was a FB hold-out for a long time but that’s another story) in Rhizo14, it brought back the richness of the conversations that I had been missing since the central forum was dropped after PLENK. It may have more to say about my industriousness or rather lack of, but it made wider participation more accessible for me. That’s my story. Thank you for yours. I had forgotten how impatient I used to get with folks whose links sent me to that that impenetrable wall of a log-in screen. All I can say is that for me the payoff has been worth whatever Zuckerberg (and Google) harvest from me in return. I like that we all have our own stories, and they start to weave together …. I really appreciated this post. Having been active in fb, twitter, g+, blogs etc I find it intruguîng how the “the rhizo14 fb gp” has been categorised. Not sure where I should be put…in a bin marked ‘unclear’? Whatever the spaces, thank you for helping me learn so much and have so much fun. Thanks for this Kevin. I commented on the group being open to everyone on Facebook but not everyone on Rhizo14 here https://francesbell.wordpress.com/2014/04/16/ethics-and-soft-boundaries-between-facebook-groups-and-other-web-services. Interestingly Facebook has relabelled Open groups as Public groups and maybe that gives a peek into their plans. As part of research for a paper I have been writing I have taken (anonymised) data from the Rhizo14 Facebook group using netvizz and am now trying make some sense of it. The twitter data has been very useful to identify ‘events’ but the interesting thing about the Facebook data is that the nodes are people and posts, and the different measures give different networks. I think it is going to be of most use in comparing with the busy events on Twitter. P.S. Jim – I agree with you about the forums – that was my experience in CCK08 but I know that others disliked them. A Facebook group is different from from a Moodle forum though. Facebook has different design goals. The Rhizo15 Facebook group does feel weird without you, Kevin. It feels a bit odd going from space to space – most often Twitter and Facebook, but occasionally Google+, trying to readjust to different group dynamics, sometimes the same people being present and others not being there at all. i have my computer set to open up to a couple of blog readers, facebook and my twitter feed, but that means that i only really check that out when i re-start my computer, whereas the FB feed stays open all day. life, work, learning, leading, following, thinking… all these things are coming together on Facebook for me, in that rhizomatic nomadic “felt”-like way but with some recent discomfort in that there’s also relationships in there, some of which are easier to negotiate than others, some of which have clearer boundaries. do i really want the people i work with to know what i think of the systems they’re entrenched in, in relation to nomadic potentialities they haven’t considered? or do i want them to see those posts in ways that are not dialogic and will feel positional rather than invitational? on the other hand, i got this great tweet from someone this morning and when i tried to find out who the person was – who could be that insightful, vulnerable, connective in so few characters – i couldn’t find out anything about them other than the history of their previous tweets and a link to google+ which feels to me like FB feels to you. appreciated this post as much as your others, not least because of this idea – “what did i miss?” and maybe it’s even what qualities must i have to participate there (for you, on FB, for me in other platforms) and i like the interrogation of entitlement that gets raised. FB is easy and accessible, or is that my delusion? i know only a very few people who have told me they can’t figure it out. that matters most to me. the idea that some people got left out / felt left out is interesting, but particularly in juxtaposition to who didn’t even get started on those other platforms. one of the things i had to do during this #rhizo-round was rethink Google+ and consider whether i had been wrong in my assessment of it, and then attempt to do some stuff there. this idea, relatively publicly (in that people who know me were texting me saying why are you on Google+ now? and then i had to say “maybe i was wrong”), is part of what i’m thinking about characteristics we bring to these different platforms. i’ve been interested to see in the blogs, for example, how quickly people can think and write. on twitter, how profoundly people can summarize. etc. See you on the Interwebz! I would abandon FB, G+, and the full catastrophe if…I could recreate it some other way with my own, open-sourced and self-hosted tools. That was the appeal of federated wiki and even proprietary tools like Slack that are more controllable. I find all of these tools anathema in the long haul because systemically they are full of unforgiving blindspots, tragicomic at times. So…don’t worry Kevin. If being on FB makes or breaks your identity online, then I say it ain’t worth it. In fact we always need outsiders and folks from the margins. Very handy folk even if they are often prophets without portfolio. Anti-spam: oh scheme. O, schemes, carry on ‘as if’, Facebook, too, shall pass.